Last Wednesday, President Obama was the lead story on many television stations, proposing a new plan to eliminate “conflicts of interest” that investment advisors have with their clients. This begs the question: Can government regulate ethical behavior? This article explores how ethical behavior is incentivized, either on purpose or by neglect, even down to how the real estate industry regulates emails and signs posted that property is for sale. 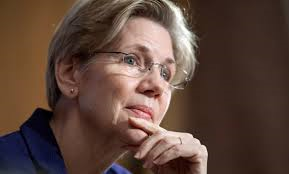 In speaking to AARP last week, President Obama said, “Financial advisors…shouldn’t be able to take advantage of their clients.” What you didn’t hear on the news was Secretary of Labor, Tom Perez, discussing “the corrosive power of fine print, hidden fees and conflicted advice” and that the president also promoted Massachusetts Senator Elizabeth Warren, who has been popular since her 2012 election with a platform stating that the financial industry takes advantage of people. 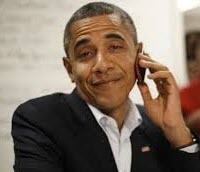 Obama’s plan to regulate ethics is to be presented by Labor Secretary Perez, who on a conference call with reporters, was joined by John Bogle, founder of the largest mutual fund family, Vanguard. What you also did not hear is that Vanguard’s business model doesn’t offer financial advice and Vanguard directly competes with firms that do offer one-on-one education on financial issues. For the average person who wants personal financial education, the best source is often a highly trained, licensed financial advisor. There is always a fascinating story behind the story, and the backstory here is that the new claim for additional government regulation will not work. The untold story is that the financial industry is already one of the most heavily regulated industries. Financial advisors only get into the industry after an intensive hiring process where only the most qualified are accepted. Advisors must pass a test to become licensed by FINRA (Financial Industry Regulatory Authority), the not-for-profit organization authorized by Congress to supervise the 637,000 brokers in the US. In addition, each office where the financial advisors are employed has an operations staff that reviews account paperwork and transactions, and most offices have replaced their sales manager with a compliance officer. The accounts of each financial advisor are reviewed regularly to insure compliance with a client’s investment objectives, and accounts that are too active receive letters and phone calls from the office’s compliance office. Financial advisors cannot send emails or letters to clients without approval and can not use excessive language in any communications. 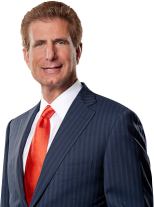 Morris Bart could never be a financial advisor because he could not imply that all you needed to do was call him to get your money. The reality is that financial advisors are trained to provide a high level of service to clients which encourages referrals which helps them grow their business. Like buying a car or a house, consumers have the responsibility to become educated about their purchases to make the right decision, and in the investment arena the best education on investments can come from your local financial advisor. The free market is more efficient than government at weeding out the poor performers, if we just let it work. Educated consumers seek out the best service providers, and poor service providers go out of business. That’s why businesses are always evolving, trying to provide the highest level of service. The real estate industry is also highly regulated, but not like you thought. Licenses are issued by each state’s Real Estate Commission. There is HUD and FHA and FNMA and GNMA but there is no federal government real estate agency regulating real estate agents. Louisiana created its Real Estate Commission in 1920 but it wasn’t until 1972 that agents had to pass a test to obtain their license. While the Louisiana Real Estate Commission’s main function is to issue the licenses, they are also charged with protecting the public’s interest. The LREC is the only resort for consumer/agent disputes and while every purchase and sale agreement references the parties will abide by the LREC rules regarding deposits, the fact is that the LREC tells parties in deposit disputes to take their claim to court. The only other real estate body is a trade organization, NOMAR (New Orleans Metropolitan Association of Realtors) which was chartered in 1915 by the National Association of Realtors that applies ethical standards only to its paid members. The Louisiana Real Estate Commission has adopted Rules and Regulations pursuant to the authority granted in the Louisiana Revised Statutes, Title 37, Section 1435. The Rules and Regulations serve as an extension of the Real Estate License Law and assist the Commission in enforcement. The rules regarding the conduct of agents cover a wide range of topics, including advertising, mold, franchise operations, presentation of offers, and broker cooperation, but nothing about procuring cause, which is widely misunderstood. Internet advertising must include the broker’s name, city & state, and license jurisdiction. 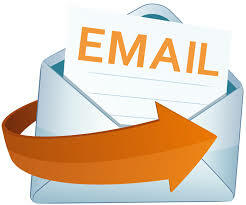 Emails must include must include the broker’s name, city & state, and license jurisdiction. 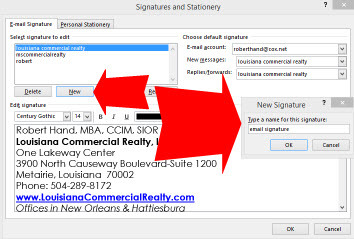 There is no training from LREC or NOMAR on how to use technology to comply with email requirements, but here is how to have your required broker name, city & state and license jurisdiction automatically added to the bottom of every email. 5. Then under the Email Signature tab select the New button. 6. Type in the name for your New Signature. 7. Highlight Select Signature To Edit. 8. 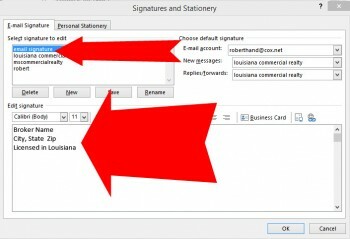 Type in signature information under Edit Signature box. 9. 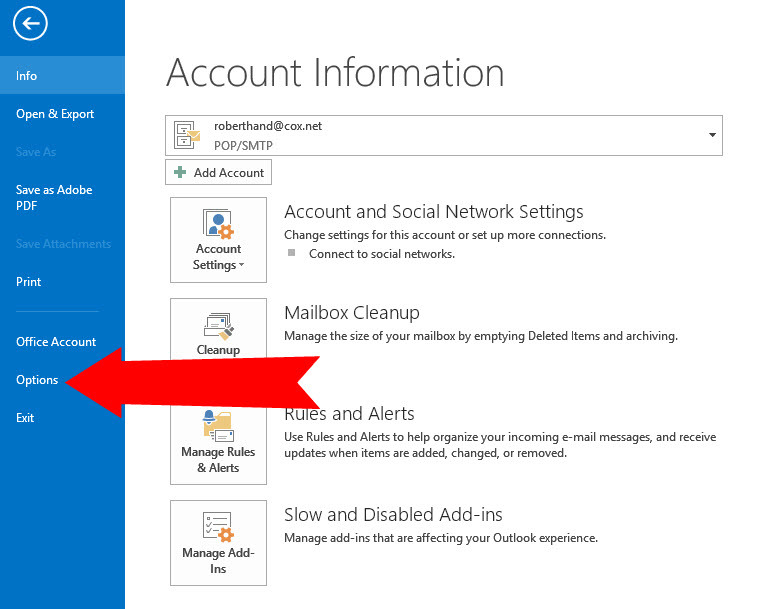 Click OK then OK.
Now every email you send will automatically add in the required information. Select top left button “Mail” then “Back”, and your information is saved. Nominate a friend’s best or worst email signature and get $10 donated in your name to your favorite charity. Send your nomination to roberthand@cox.net. Interested in graduate school? For a free lesson on configuring email signatures to add pictures and hyperlinks to websites, or icons that link to facebook, twitter or linkedin, send us an email.